Home › Home and Kitchen › Serving Bowls - Serve And Stack In Style - Colorful - Oatmeal - Breakfast - D.. Serving Bowls - Serve And Stack In Style - Colorful - Oatmeal - Breakfast - D.. PUT SMILES ON YOUR FAMILY's FACES. Brighten up your home with this durable, Uno Casa stacking bowl set and perfectly matching spoons. Order now at our special sale price. END BOWL SHAME TODAY! Do you find yourself hiding away your tatty bowls? Well, no more! You'll want the world and his wife to see these colorful beauties. Complete with storage rack to keep them on display and save valuable cupboard space. EAT YOURSELF SLIM. Could these bowls actually make you live longer? Well, in a way, yes. They're designed for optimum portion size - stay slim by avoiding overeating. Cambridge University found a reduction in plate size reduces calorie intake (if you're looking for super XXXL bowls for massive portions, these are not for you). They measure 5.5 inches in diameter and 2.5 inches in depth. MORE MONEY IN YOUR POCKET. Smaller portion sizes = cheaper grocery bills. Premium quality = spending less replacing broken bowls and spoons. The display rack keeps everything together so it won't get lost. It's all durable enough to throw (please do not throw) in the dishwasher after use. ZERO RISK (unsuitable for adrenaline junkies): We're pretty darn-tootin' certain these are the stackable serving bowls missing from your life. But if you find that's not the case then we'll give you a full refund. Just let us know within 30 days. 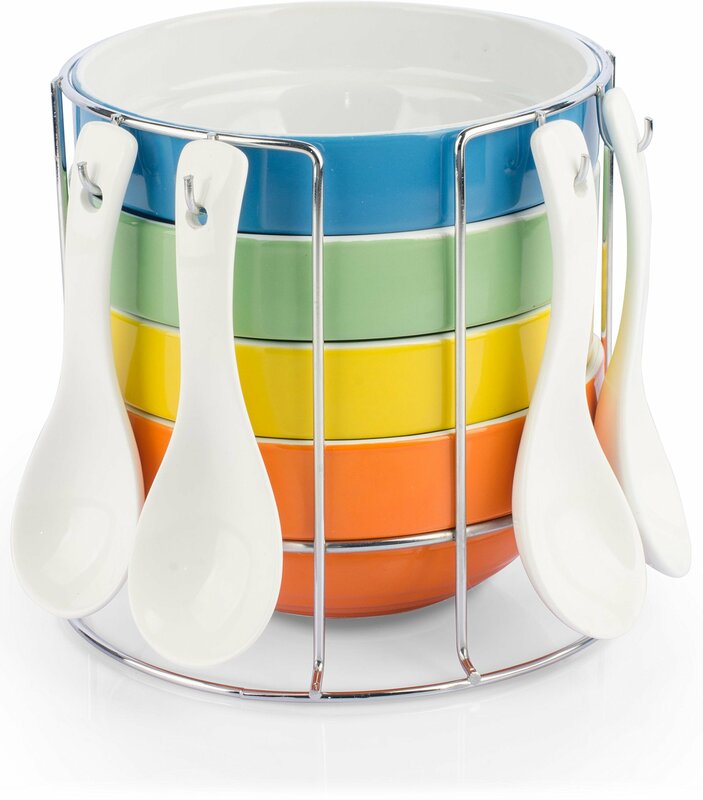 Serving Bowls - Serve and Stack in Style - Colorful - Oatmeal - Breakfast - Dessert - Ice Cream Bowls - Set of 4 - Free Rack and Spoons - Stackable Colorful stacking bowls so beautiful they'll make your food taste better. Sure, they look good, but here are the cold, hard facts. There are 4 bowls perset. They are yellow, orange, green and blue. They could be considered to bepastel colours. Each frankly delightful bowl measures 5.5x2.5 inches, weighs-in at a charming 17oz and will arrive packaged in a gift box. Now, picture the scene: your hungry family are just minutes from home. You'velovingly prepared their favourite dinner. You can't wait to watch themexcitedly shovelling that delicious gruel down their gullets. This will be adining experience to savour. Do you really want to ruin the occasion byserving up their slop in an inferior bowl? Of course you don't. That's where these Uno Casa bowls really come into their own. Watch the joy ontheir faces as they grab their bowl from the polished aluminium stand, pick uptheir matching porcelain spoon and chow down on your home-cooked food. Theysay you eat with your eyes, well your friends and family will soon have aneyeful to remember. Your soup (miso or otherwise), cereal, oatmeal and dessert life will be theenvy of the neighbourhood. It is likely you'll find yourself looking atinferior bowls with disdain. You must work to overcome these feelings ofsuperiority. As in any emergency situation, you should ensure your own safety beforehelping others. So, once you've safely bought your own bowl set, startthinking about who else could benefit. Ask yourself, 'who has served me froman embarrassingly boring, old, chipped, monochrome stoneware bowl lately?' UnoCasa bowl set to the rescue! Finally, we have to mention 'bowles' and 'bowels', common misspellings of'bowl'. If you came here looking for a colorful matching bowel set withmatching spoons, we recommend you consult a qualified physician immediately. What's included with each set? There are 4 bowls per set. They are yellow, orange, green and blue. They couldbe considered to be pastel colours. Each frankly delightful bowl measures5.5x2.5 inches, weighs-in at a charming 17oz and will arrive packaged in agift box. Easy to Store & Perfect to Display Watch the joy on their faces as they grab their bowl from the polishedaluminium stand, pick up their matching porcelain spoon and chow down on yourhome-cooked food. They say you eat with your eyes, well your friends andfamily will soon have an eyeful to remember. Benefits of buying our Stackable Serving Bowl Set of 4 by Uno Casa _What's more? _ Attractive and colorful - we are the only ones in the market with this itemand unable to find this with anyone else. _Gift-boxed_ Yes, that's right. Give as a gift as it comes beautifully packaged in ourbranded gift box for the easiest solution. A perfect gift for a Mother's Day, a birthday or any occasion. _Safe To Use_ Use in the microwave and the oven for easy heat up & use. Once you're done,it's easy to rinse off or put it in the dishwasher for a hassle freeexperience.